If you are a foodie, outdoor adventure enthusiast, brewery hopper, admirer of the finer arts, or just a person looking for place that has good vibes: Welcome to Asheville, North Carolina! Asheville is nestled in the beautiful Blue Ridge Mountains and is a true gem of the South and here are just a few reasons why! 1. The Views. There is no denying the awe- inspiring beauty of the Blue Ridge Mountains and the outdoors. When you live in Asheville, nature is your neighbor and Instagram worthy mountain ranges are right in your front yard. 2. The Adventure. With nature and the outdoors comes adventure. Asheville provides the best for those seeking an active, exploratory lifestyle. Your weekend will be filled with hiking to the peaks in the Pisgah National Forest, Ziplining through the trees at Navitat, or paddle boarding the French Broad River. 3. The Biltmore. 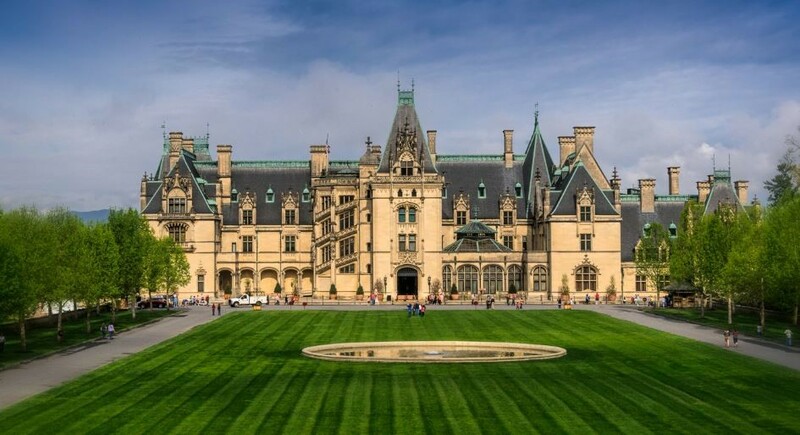 Asheville’s Crown Jewel was created by George Vanderbilt 1895 as a retreat reminiscent of the grand castles and estates of France and Britain. It is the largest privately-owned home in America and is still managed by Vanderbilt’s descendants. Now, maintained in its glory you can tour the halls, get lost in its beautiful gardens, explore the winery, or simply bask in the beauty of the Biltmore’s incredible architecture. 4.The Food Scene, The People, and The Good Vibes. Asheville has endless entertainment and an all-inclusive mentality to ensure no matter where you come from you feel at home! Indulge in all your foodie cravings as Asheville is home to some of the best farm- to- table experiences in North Carolina. You won’t want to leave Asheville without stopping by Tupelo Honey, HomeGrown or Farm Burger for a bite to eat (Trust us – your taste buds will thank you!) Explore the River Art District and watch glass blowing at Lexington Glass works, or spend your days exploring the south slope Brewery Hopping. No matter where you go you will likely strike up a conversation with the Locals as when you walk into art gallery, restaurant, brewery or coffee shop you will find people who are passionate about what they do and are happy to share knowledge about why Asheville is so one of kind!